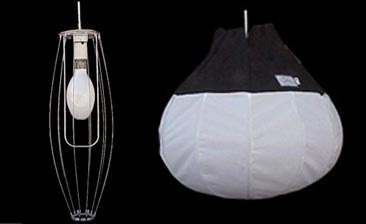 This product replaces the conventional paper lantern. The JEM Ball radiates a soft surround (360 degrees) lighting effect with fewer shadows than conventional lights. The JEM Ball’s sturdy construction makes it both durable and reliable. JEM Balls come with bleached muslin and fabric grid (rip stop) fabrics. 22”: 1K or 500w with Tungsten Harp; 200 or 400 Joker with HMI harp.